Nothing beats waking up and seeing the sun rising above the ocean outside your window. This experience can be yours at Altos Apartment. This unit has one bedroom (queen sized bed), living room, bath and an open kitchen. Both the living room and the bedroom look out to the ocean over a deck that invites you to linger. Enjoy the ocean breeze throughout the apartment. Watch for dolphins from the kitchen while preparing meals or making your favorite drink. As with all Casas de la Playa properties, the unit is fully equipped from pots and pans to linens and towels. In winter, Right whales have been spotted from this location. Year round the birds and vegetation are wonderful to watch. This is an idyllic place for a weekend, a week, or a longer stay. Also, no need to trip over your belongings – there is ample storage in the large closet as well as a utility closet. Make Altos your private perch for contemplating the sea at Flagler Beach. As a part of Casas de la Playa Beachside, Altos is hidden away in a sleepy residential neighborhood by the ocean. Located several blocks south of the Flagler Beach Pier, you are still close to large variety of shops and restaurants, but out of the direct push of tourist traffic. Stay at Altos, and live like a native. My partner and I fell in love with this property over 20 years ago while we were both teaching in Gainesville, FL. We remodeled it for our weekend use since we lived only less than two hours away. We have been offering it as vacation rental since 2001. We now live in Miami Springs, and plan to retire in Flagler Beach in the future. I welcome your inquiries through this website, or by phone, or e-mail. I will respond quickly. Although we no longer live close to Flagler Beach, we visit often, and we have a local caretaker who attends to maintenance of the property and to the needs of our guests. We have come to Flagler Beach since the early eighties. We love the quaint and tranquil environment, without franchises, or high-rise buildings. This is a wonderful beach community with the flavor of old Florida beaches, unrushed, friendly, and the beach is never crowded. Often you can look in both directions while sitting on the sand, and see no one, or one or two people in the distance. On weekend, a few more people show up. Almost everything is walking distance, if you like to walk, or a very short driving distance with ample parking everywhere. This cozy duplex across the beach on A1A has full view of the ocean. Each apartment (Casa Altos or Casa Bajos) is fully furnished and has one bedroom, bathroom, living area, full kitchen, microwave, cable TV, and central heating and air. Each unit is simply but tastefully decorated to accommodate Florida vacationing at its best. Enjoy the ocean breeze from the living room or bedroom. Watch for dolphins while preparing meals or your favorite drink. In winter, Right whales have been spotted from this location. During Spring and Summer the birds and vegetation are wonderful. This is an idyllic place for a weekend, a week, or a longer stay. We are located only a few blocks south of the Flagler Beach Pier and close to shops and restaurants. This is a non-smoking unit. The most attractive aspect of Flagler Beach is its peacefulness and small beach community charm. There are no franchises on the beach, nor high rises. There are several small local restaurants and cafes with excellent food, a couple of galleries, some nice bars, and a friendly neighborhood. Marineland is 10 minutes north, and Daytona Beach is 20 minutes south. Historic St. Augustine is a half-hour drive away, and Orlando and Disney are within an hour's drive. Major airports are within an hour and a half drive. The sunrises are fabulous at this time of the year. Sit and relax on the porch, or take a chair to the beach. The beach walkover is one and a half block north. The ocean water temperature is cool this time of the year, and the sun is bright and warm. At night sit and contemplate the constellations and the planets from anywhere, the balcony, the beach, or walking around the neighborhood! This is an ideal place for moon lovers, and star gazers. Fish from the beach, or from the nearby pier. Bring your own bicycle and enjoy riding around this small community! From this property you can watch the ocean all the time. During the winter months Right Whales may show up, and dolphins are visible year round. There are also at least two gopher tortoises calling our front yard their home. These are protected species and if you don't get too close they will move around while feeding on the vegetation without much concern. The upstairs bathroom has a bathtub. The downstairs bathroom has a shower. Both units are equipped with towels, hand towels, toilet paper, soap, and other necessities. Bed sheets, pillows and pillow cases. Blankets are also available. Bath, and hand towels as well as wash clothes are provided. Each unit has a microwave. The unit is equipped with gas stove and oven. The front yard is a natural habitat. There are at least two gopher turtles living in this front yard. These are endangered species, protected by law. Please enjoy them but do not disturb or feed. The upstairs unit has a wrap-around deck. Upstairs Unit: The upstairs wrap-around balcony allows you to enjoy the sun, the unencumbered view of the ocean and the lovely vegetation. You'll have full view of the ocean from the kitchen, bedroom, and living space. Downstairs Unit: This unit provides the privacy of a ceramic tile terrace facing the ocean, and a private garden, also facing the ocean. From the kitchen and the living space you have a wonderful view of the ocean. Each unit has a full kitchen and is equipped with gas range, refrigerator, micorwave, pots and pans, flatware, dinnerware and all kitchen utensils. Linen and towels provided. Cable TV and Wi-Fi. An outdoor shower with cold and hot water is available to rinse or shower after swimming in the ocean. The upstairs unit accommodates up to four persons. The downstairs unit accommodates up to three. For larger parties, arrangements can be made to rent both units at the same time, at a discounted rate. The deck at Altos gave us great views of the ocean. The house was supplied with all that we needed, towels, appliances, dishware. It's a mile to get into Flagler Beach at the pier but it's an easy walk. The place is pet friendly although our cat did not like looking out the door so she spent most of the month under the bed or under the covers. We spent an enjoyable month. Love being on A1A looking out at the ocean and I like his other units he has in town great location. Great Place to Welcome the New Year! We were lucky to be able to get the upstairs and downstairs units at the same time since we were traveling with extended family to celebrate the Holidays. The view from the upstairs is amazing. Sun rises are incredible and having meals in the deck at sunset spectacular. We had a great time! Love this location, it's within walking distance to many restaurants. Great for relaxing and enjoying the ocean view. Loved sitting on the deck and listening to the waves. There are several beautiful golf courses in the area. Really enjoyed playing golf and getting to relax and unwind. Can never go wrong staying here. 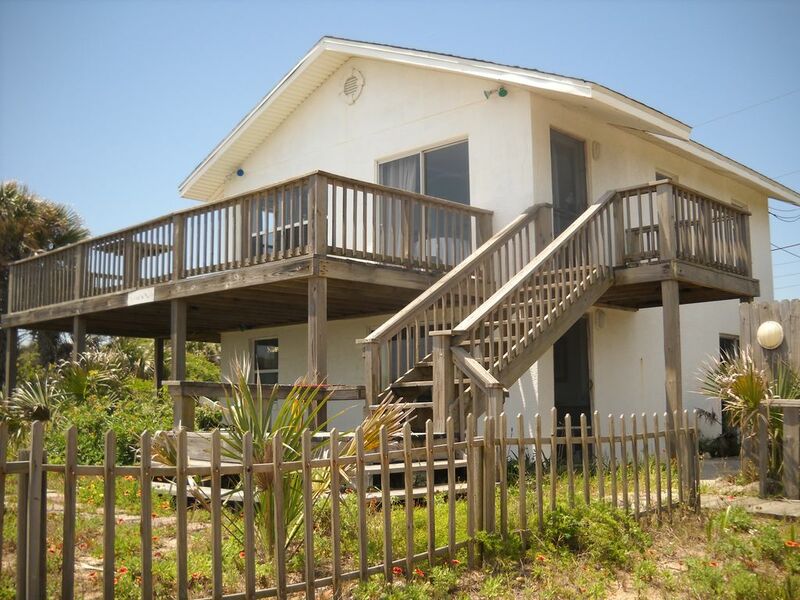 Comfy, chic, waterfront with great beach access! We just loved staying at Andres' place! What a cozy beach bungalow with outside shower and a natural front lawn overlooking the Atlantic! Location, location, location. This place is the best of Flagler Beach. Nicely decorated, comfortable, and with great view of the ocean from sunrise to sunset. We'll be back! Thanks. Please read, sign and send back our renter's agreement.